Nihonsugi Toge Mountain Pass is located on the border of Yatsushiro City and Misato Town, at the entrance of Gokanosho area. The beautiful nature in this area is enjoyable all year round, from fresh greenery in spring and summer, autumn foliage to hoarfrost in winter. 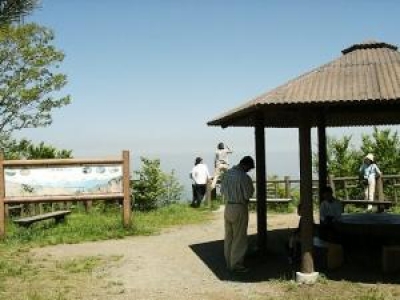 There are an observatory and restrooms nearby, and you can see a great view of Karimatayama Mountain in the front. 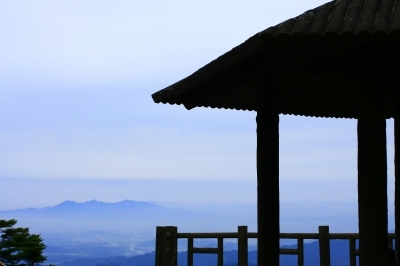 On a sunny day, you can also see a panoramic view of Kumamoto City and Ariake Sea. Nihonsugi Toge Mountain Pass has a rest area and a foot path, and has also a gate to Karimatayama Mountain. On the mountain, katakuri Asian fawnlily grows wild in April to early May, which is very rare in Kyushu area. Nihonsugi Toge Mountain Pass is also a popular spot for autumn foliage. Anyone, young and old, can enjoy walking along the foot path.